This looks beautiful! I don't think I will be able to have this brand in my collection but I am enjoying seeing with you! I am loving your Ozotic posts! Also love how you are rating them - it makes it much easier to know which ones to add to my wishlist:) I missed out on all the kaleidoscopes so I think I'll have to pick up some of these - they look quite similar. Does the holo show up in low light aswell or only sunlight? 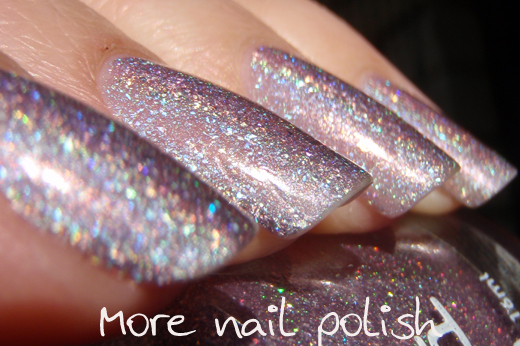 this is so very cute, perfect lilac holo! these are all so beautiful! a bit pricey but they look to be worth it! Aithne - I know, it must be hard for international ladies to see these, knowing how hard they are to get. Sorry. Kristy - Thanks sweety, right back at you! Millie - These 600 series are actually not too bad in low light. They do show some of their holo, better than Kaleidoscopes and much better than fine particle holos. Bevy Doll - thank you. gri - Yeah, for gals overseas you can only get (some of) these from Picture Polish for $14.95, but us Aussies are able to get from other suppliers much cheaper, I got this for $7.95. i'm really diggin your ozotic polish posts. gorgeous! wish i could have some! 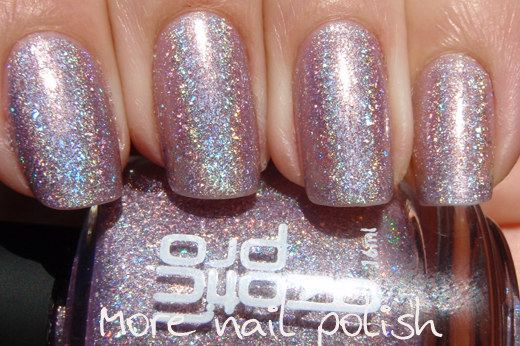 I need more ozotic holo goodness in mt life !! Beautiful colour and great swatch!!! Uau, this is so gorgeous mani! :) Where did you buy Ozotic polishes? Hi, I don't see a better way to get in touch, so this isn't intended to be a published comment on your blog. I'm guessing you have comments on Moderation, if not, please forgive me for leaving links (none mine). If you don't mind, please disregard. If you do, good luck and feel free to get in touch. Thanks Siobhan - I've sent you an email. Beautiful!! Like flakey linear holos! !